This. Is. Not. A. Drill. You heard me correctly. To help ease everyone into the holiday spirits (see what I did there…) with one of my favorite holiday companions– Fireball Whisky. 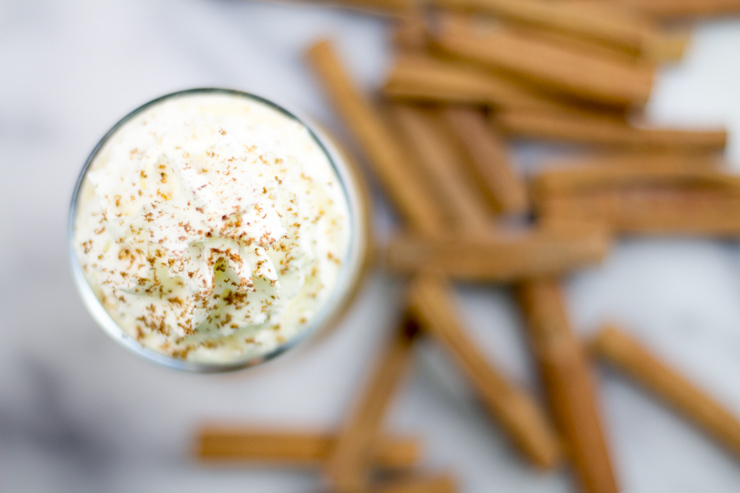 The cinnamon punch is basically born to be mixed with a hot cider. Keep reading to see how to mix this up for your own holiday party. Works great for a party of 1, too. 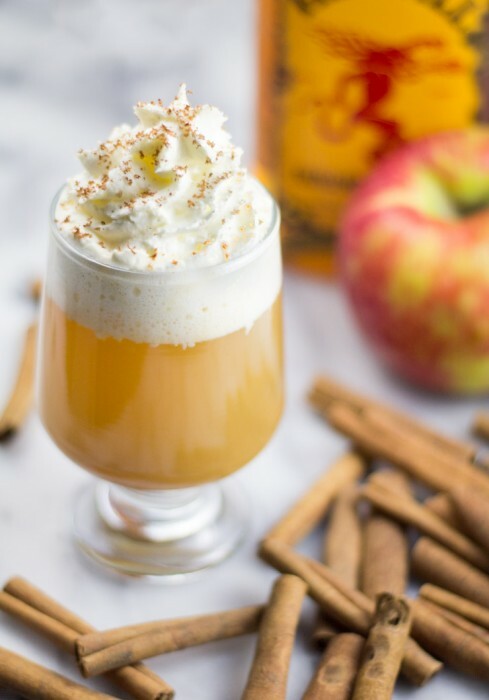 — Steamed Caramel Apple Cider with Cinnamon Fireball Whiskey Whipped Cream. First things first. The booze. I learned something new while I was writing this post. Fireball Whisky (not to be confused with whiskey; a more Southern thang, apparently) is a Canadian-born concoction, first developed in the 80’s (because everything amazing was produced in the 80s… like me!) produced by the NOLA-based Sazerac Company. No, they didn’t ask me to post this. I seriously just love the stuff this much. The idea was pushed to the front of the posting table recently when I went to a local Nashville event that offered a few different Fireball cocktails. Mixing it together with some holiday tunes and whipped cream seemed only natural. Since I’ve focused so much on the whipped cream (naturally), I suppose I should hit a few points about the body of the drink. While I support completely just filling a cup with the crown of this steamy cocktail, you may add the cider, if you must. Any cider will work well for this. I would even recommend using some of the leftover honeycrisp cider that you might have left from making those delicious Honeycrisp Cider Caramels. That would give a nice tartness to the drink. This time around, I just used my favorite local cider and some leftover caramel sauce that I had. A good dulce de leche would work beautifully. I’ve even just used the caramel you might buy for ice cream topping. Steaming the cider and caramel combo is really where it’s at. For some reason, steaming gives a drink such a different heat and overall feeling than popping it into the microwave. 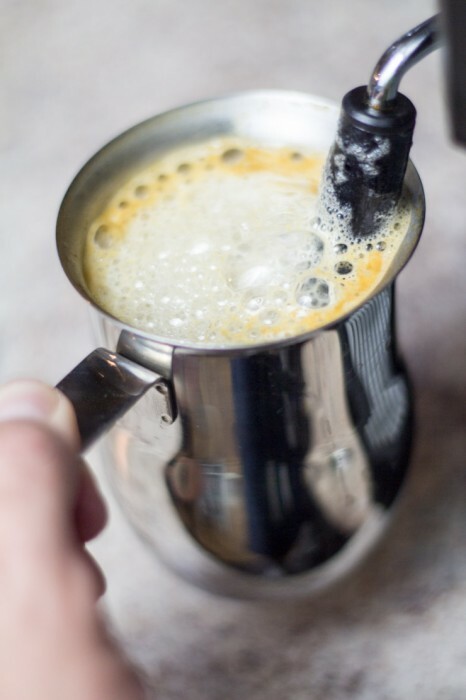 If you don’t have a steaming espresso machine [also an amazing gift at under $100] or something similar handy, I would opt for heating the cider and caramel a bit in a small saucepan before I would venture into the microwave. Another recommendation that I would have for these would be freshly ground cinnamon. There is such a drastic difference in taste of store-bought ground cinnamon versus freshly ground sticks. I keep my Microplane grater going in full swing during the holidays for exactly this reason. Stocking stuffer, what? 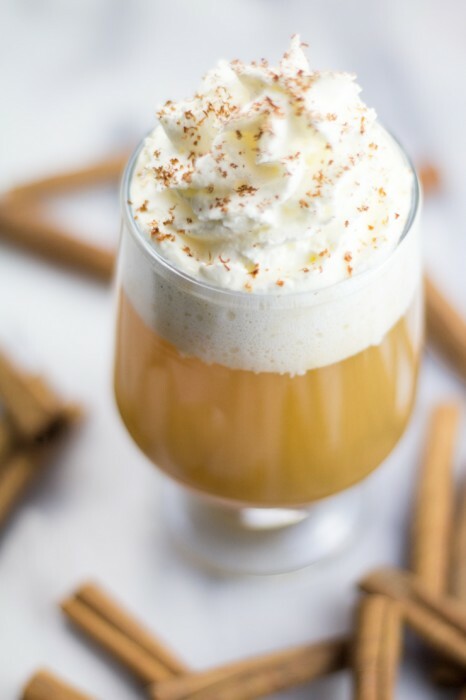 How cute would it be to have some fresh cinnamon sticks out around the drinks for your Christmas party so that your guests can grate their own over the top of the boozy whipped cream? Memorable and personal. I say go for it. Here we are! Steamed cider with a bit of caramel to balance the tartness of the apple. Homemade, cinnamon whiskey/whisky whipped cream on top with a bit of freshly-grated cinnamon top kiss the top. It’s ready for the party! 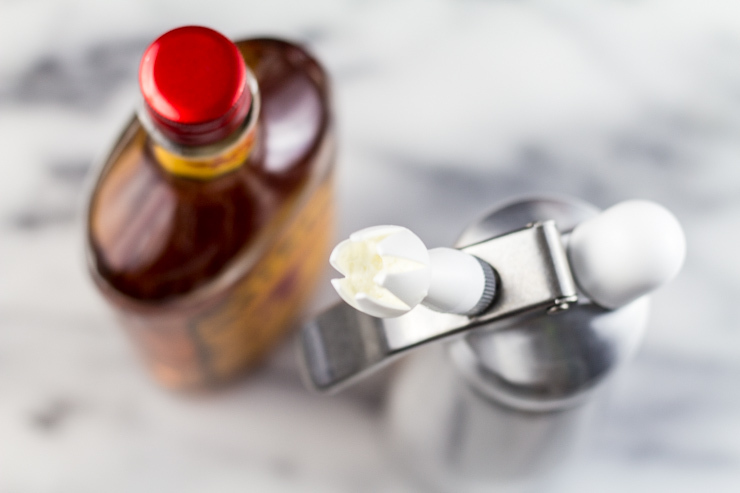 If using a whipped cream creamer, place cold cream, powdered sugar and whiskey in dispenser and shake 3-5 times per whipped instructions. Hold in refrigerator. Alternatively, whip cream and sugar in mixer until stiff peaks. fold in whiskey and keep chilled. Steam (or stove-heat) the cider and caramel (and cinnamon, if desired) until hot. I aim for about 145-150 F if you want to fool with checking it with an espresso thermometer. Top with cinnamon whiskey whipped cream. Finish with freshly-ground cinnamon (I use a Microplane grater to get the perfect grind). Visit SouthernFATTY.com for more recipes and food photos. Note: Makes a full dispenser of whipped cream. Easily store in refrigerator. Comment and tell me what you are making for the season! Oh.. And keep an eye out for something BIG on the site soon. That is f’ing brilliant. I have all the ingredients and even the gadgets. Totally agree on the whipped cream canister thingy, invaluable in my house. Think I know what I will be making as a beverage while we do family tree-trimming this Sunday! Thanks! Those creamers are so much fun once you start playing with them. I’ve done some fun non-whipped cream things with mine so far. Hope you enjoy it! Fireball used to be my jam! I still love the stuff, but I’ve calmed down into a more refined Fireball drinker instead of a frat boy. 🙂 Cider, caramel, cinnamon whisky = SOLD! Also, must get whipped cream thingy asap! I mean. I’m pretty sure the rule is that if it’s in cream, it’s totally acceptable at any place in your life!